We fell off the wagon toward the end of the week last week and ended up eating out way more than we should have. All the more incentive to stick to our plan this week, right? Something that I have been doing that is making menu planning easier for me is keeping Wednesday & Thursday of every week the same. We always eat leftovers on Wednesday and we always eat out on Thursday because that is what works best with our family activities. It is really nice to not have to think about those two days when writing out my menu plan each week and it saves me time. Read more about my approach to menu planning here. 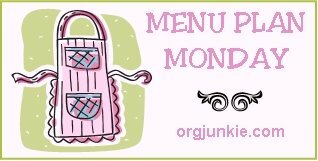 For lots of menu plan inspiration, be sure to check out Menu Plan Monday hosted by I’m an Organizing Junkie. Your menu looks great. By Thursday I’m ready to eat out too! Great plan!